That same color are the huge and heavy boxes from Model Factory Hiro containing the new 1/12 scale wonders: two of those four Ferrari 250GTO that only had the next corner in mind that day. Hundreds of pieces, awesome fittings, fully articulated pistons and rods, fully functional steering, ... just brutal. Since it's imposible to find the right words to describe them, don't miss the four videos we've just added to the product extended description... you'll turn Ferrari red from excitement! 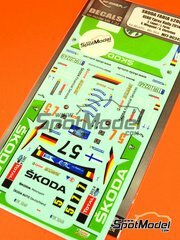 If you've not break a sweat yet, the heat rises on with two new versions of the Porsche 917 in 1/24 scale, plus a bunch of new Mf-Zone decals for the Citroen DS3, the Skoda Fabia and the Ford Fiesta S2000, each more interesting than the others. And coming down back to earth, or better said back to the asphalt, two new Scale Production rims for Porsche, and a spectacular rims/details set for the new reedition of Revell BMW M1 kit. 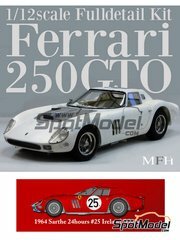 Another 1/12 scale master piece from Model Factory Hiro: the rims are fully broken up, with all pieces chromed one-by-one; the engine, in white metal, includes even fully articulated pistons and rods; tyres are rubber moulded, and the bodyworks comes in gloriously moulded white resin. An astounding kit that will certainly become legendary. 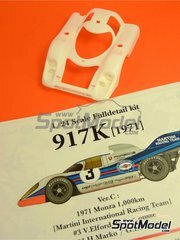 Model Factory Hiro brings us this 917K with the Martini decoration used in 1000 Km. Monza in 1971, featuring the tall rear spoiler and in two different versions (both included in the box), mainly differing in the additional ventilation tubes fitted over the turbine on car number 3. 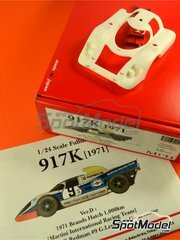 Model Factory Hiro designed this 917K version with the Martini decoration just like it raced in Brands Hatch in 1971. 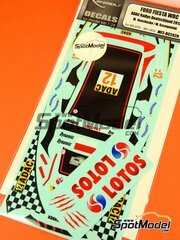 Inside the box you'll find two different versions of the car, mainly differing in the additional ventilation tubes fitted over the turbine on car number 9, modelled on translucent orange resin. 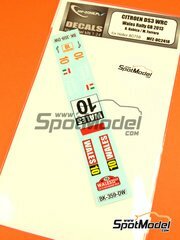 Additional decals for the Heller kit, adding the specific decals for the Wales rally to the decals already included in the kit. A gorgeous decoration in white, blue and intense red, celebrating Kubica's victory at Catalunya Rally 2013. 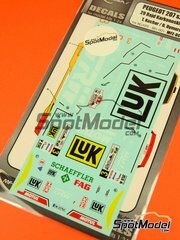 Along with the decals, it also includes a resin rear spoiler for replacing the one included in Heller kit. 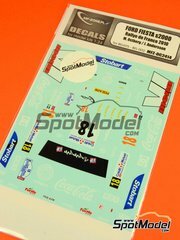 Mads Ostberg raced with this Coca Cola (Coke) sponsored decoration at the France Rally 2010, using his Ford Fiesta WRC for the second time in the world championship. Once applied over your kit, it looks really awesome with the orange background. 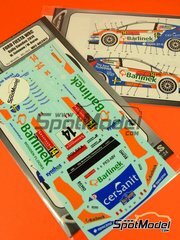 Blue and orange, a flashy color combination for decorating the Ford Fiesta driven by Sotowow at 2014 Sweden Rally, now available for your Ford Fiesta WRC kit from Belkits. 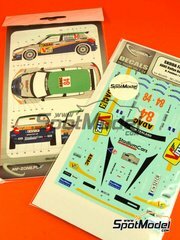 Complete decals set for decorating Belkits Ford Focus with the German Rally decoration. Don't miss these gorgeous decals that look really beautiful on the white Fiesta. A very easy to acomplish and good looking decoration. Gorgeous decoration for Belkits Peugeot 207 recreating the car that finished second at the Karkonoski Rally just 34 seconds behind the winner. 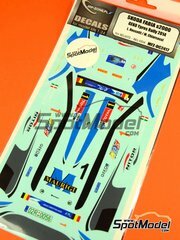 With this decals set you can decorate the of the Castrol sponsored Fabias at Ypres Rally 2014: the accident retired number 5 driven by Wiegand, or the number 7 that finished third driven by Lappi. Black stripes over white background, a simple but visually stunning design. Don't forget to use Zero Paints white on the background for a perfect result. 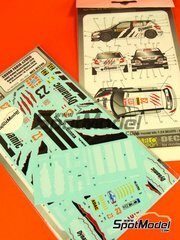 Complete decals set for decorating the Fabia that finished 5th at the Geko Ypress Rally 2014. 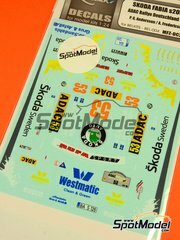 If you want to build a Fabia with a really appealing decoration, snow white background and Skoda metallic green highlights, these are the decals you were looking for. Don't forget also the Fabia color matched paints from Zero Paints to nail a perfect finish. These decals are a huge challenge: with so many colors and logos, you'll have to be 100% focused while applying them!! 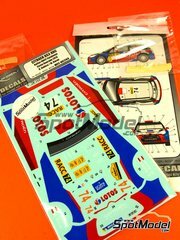 The decals from one of the most beautiful cars seen at Germany Rally 2010, in yellow and blue shades, that will fill with life your kit with just a little bit of mastery. 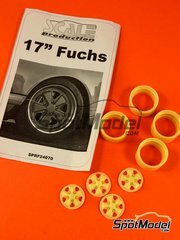 17 inches Fuchs rims set for Porsche, measuring 19,6mm x 11mm y 19,6mm x 13x2mm. Tyres not included. 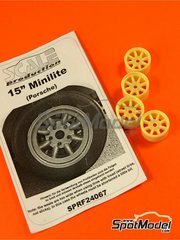 Minilite 15 inches rims set for Porsche, measuring 17mm x 11mm y 17mm x 12,6mm. Tyres not included. 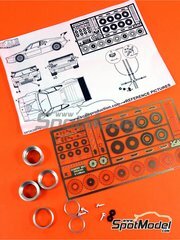 Exactly what your Revell BMW M1 needed, four great rims with top quality photoetches, right? The rims are made in turned aluminium, and the rest of the pieces including the core come in a highly detailed photoetch. Tyres not included.